The valuable ceramics collection accumulated by Giacomo Bisacco Palazzi (1875-1958), came to form part of the Scuola di San Rocco’s patrimony at his request, and is a testimony, both from variety of provenance and heterogeneity of exemplars, of the range of his interests. This group is one of the most homogenous and important in terms of quality. 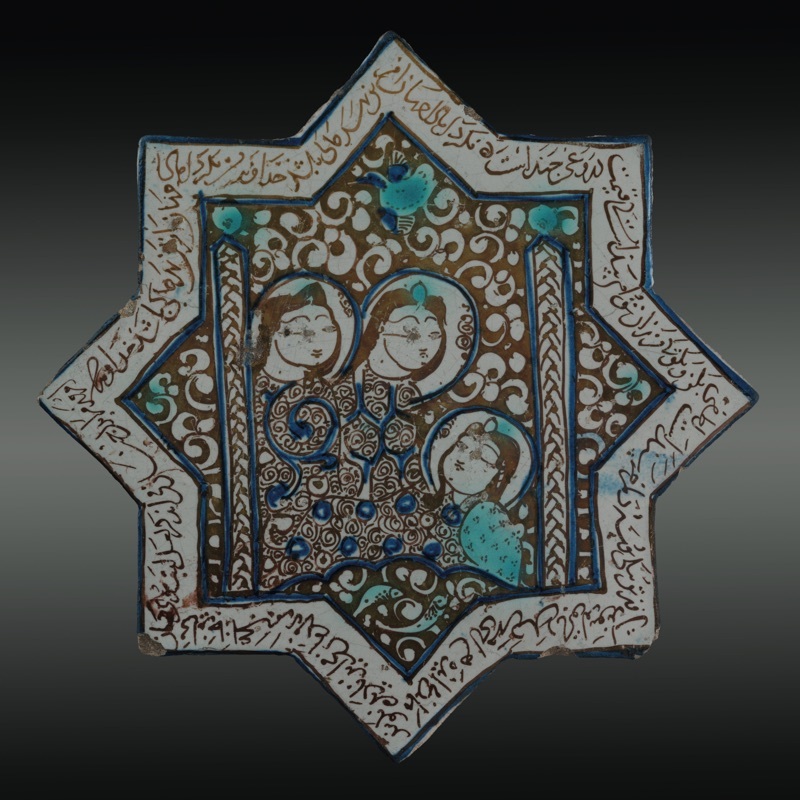 Notable are a series of Persian lusterware tiles, including an eight-pointed star-shaped pair decorated with arabesques and feminine heads (Kashan, XIIIth c.); two elegant Iranian globular flasks (Kirman ?, XVIIth c.); but the most important piece a large Turkish plate (İznik, c.1575), with typical floral motifs and well-defined polychromy, blue, green, black and Armenian bole – an extraordinary object, both technically and decoratively, as well as being in exceptionally fine condition. 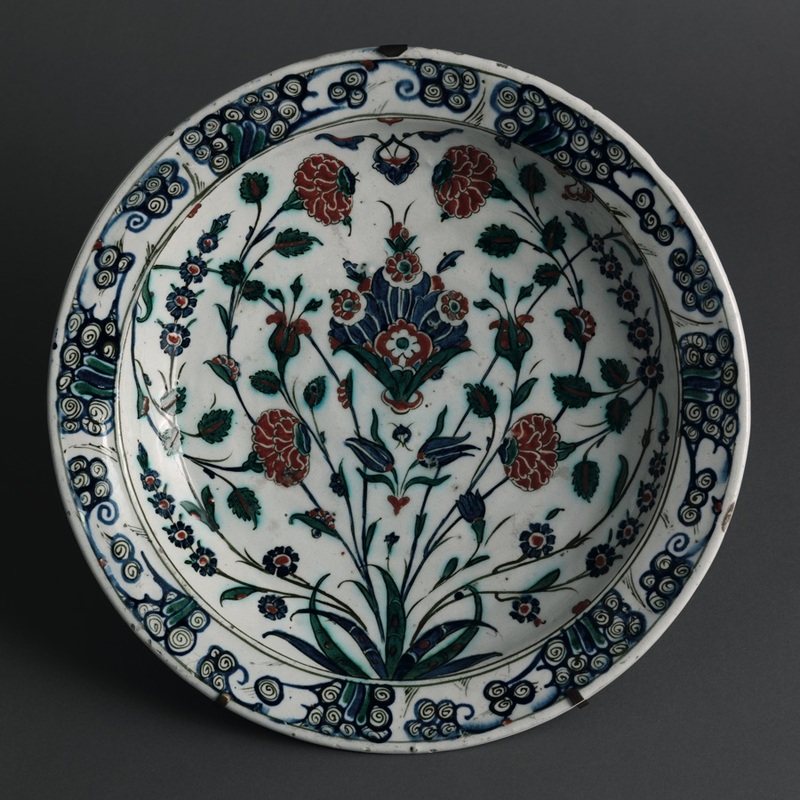 This group of ceramics, all lusterware, records the production in the Iberian Peninsula, the furthest outpost of Islamic art until at least the end of the 15th century, that is, the era immediately following the Christian Reconquista. Of particular note are an important Manises plate (end of 15th – beginning of 16th century) embellished with musical scales and a heraldic shield, splendid large bossed plates of the same provenance (15th – 16th c.) in shapes borrowed from silverware, some of Catalan workmanship with floral relief decoration (second half of 16th c.), and some again from Aragon with radial decoration and palmettes (second half of XVIth c. – beginning XVIIth c.). The panorama of Italian majolica is very wide and complex. The oldest example (from the second half of the XVth c.) is an albarello of great historical interest from Tuscany, while the sixteenth century is represented by a significant range of pieces, including an albarello from Montelupo, a jug from the upper Lazio area, perhaps Viterbo, with porcelain-style decoration, a refined Deruta lustred dish, with ‘wolf’s tooth’ decoration, and the amorous symbolism of a pair of shears with a heart at the centre. The collection’s four storied dishes are also noteworthy. The three emblazoned, inspired by woodcuts of the Metamorphoses and the Bible and characterised by refined draughtsmanship and sumptuous colouring, form part of the same service, attributable to the Urbino area (c. 1570), while the Urbino crespina (late XVIth c.) achieves a great stylistic maturity, clearly correlated to its pictorial model. Venice, Savona, Deruta, Castelli and Southern Italy provide interesting examples of seventeenth century production, with an allegorical crespina from Venice, a Savona chemists’s jug with baroque scenes, a large bowl figuring a St. Jerome in the Wilderness, of central Italian workmanship, and an albarello from Castelli synthesising styles and palettes. The eighteenth century is also well represented with notable majolica pieces, such as the group from Savona including a Levantino and a Salomoni, a Castelli panel and saucer with scenes from legend, and above all, Venetian objects from Cozzi and Antonibon of Nove, ranging from classical styles to Milan-type ponticello, with baroque fruits, bunches of flowers, and al tacchiolo. 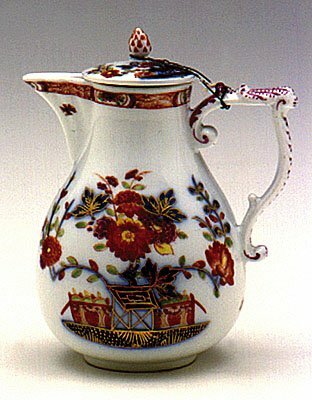 European porcelain is mainly represented by German and Venetian work. Among the first are a group of Meissen, Vienna and Ludwigsburg pieces of exceptional refinement and studied formal and decorative elegance, polychrome, gilded and embossed; Venetian manufacturers Vezzi and Cozzi are present with services and figure groups, Antonibon (from Nove, in the Veneto) with some of the most important objects in the collection, such as a small lidded pot with polychrome decoration and subtle relief work, and a group of three jardinières with figurative panels. Majolica lustre jug, German, XVIIIth c.
Star-shaped tile with feminine heads, Iran, Kashan, XIIIth c.